BOTTOM LINE: A quirky musical for young audiences that tells the story of exiled fairy tale villains and their mission to seek revenge. 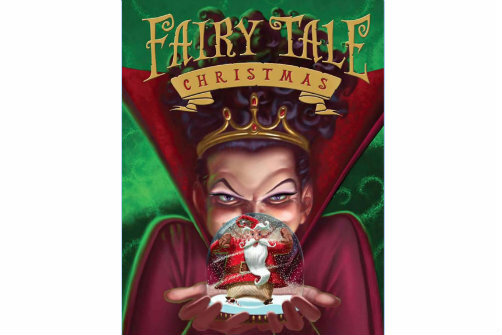 Fairy Tale Christmas begins by introducing five fairy tale “bad guys”—Medoza (the evil witch in Snow White), Agatha (the evil fairy in Sleeping Beauty), the Giant from Jack and the Beanstalk, Drama Queen (Cinderella’s evil stepmother), and Rumpelstiltskin. The four comically indulge in all things gross and nasty, while plotting to regain their glory and get back at the heroes of their stories. The plan is riddled with silly disguises, a double agent, and, to top it off, it takes place at the North Pole on Christmas Eve and involves Santa Claus. The music by M. Scott McLean and Michael McLean is high energy, fun, and memorable—you’re guaranteed to walk away with a song or two playing in your head. MK Lawson's choreography fills the small stage well; it's engaging and helps to further define the characters. The actors who play the villains sometimes double as their own stories’ heroes—they remove their outer vest or apron and are left in plain black clothing as they portray Cinderella, Sleeping Beauty, and Snow White. The actors also use different voices to represent the different characters, switching from a low, raspy sound to a light, singsong princess voice. This differentiation is for the most part effective, although it becomes somewhat confusing at times when multiple switches take place within one scene, making it difficult to keep track of the plot. But the extreme talent of this professional cast is hugely apparent. Their energy and singing voices are incredible across the board, making the show not only fun, but impressive. The dialogue and lyrics are more on the sophisticated side for children’s theater, making this show perhaps better suited to ages eight and older (as advertised) than to the younger children that made up a good portion of the audience at the performance I attended. The kids seemed to be enjoying themselves, but some things were definitely going over their heads. Overall, I greatly enjoyed Fairy Tale Christmas. It's a wonderful family show with great messages of love and the spirit of giving that parents will enjoy just as much as their children. Fairy Tale Christmas: The Musical is by M. Scott McLean and Michael McLean. Directed and Choreographed by MK Lawson. Music Direction by Caleb Hoyer. Music Supervision by McKay Crockett. Produced by John Davisi. Assistant Directed/Associate Produced by Ben Bartels. Stage Managed by Armelle Harper. The cast is Jennifer Byrne, Courtney Capek, Dan Corica, Katie Goffman, Josh Greenblatt, George Slotin, and Adrien Swenson.